Hedgehog Dogtailgrass (Cynosurus echinatus) is a monocot weed in the Poaceae family. In Chile this weed first evolved multiple resistance (to 2 herbicide sites of action) in 2004 and infests Wheat. Multiple resistance has evolved to herbicides in the Groups A/1, and B/2. These particular biotypes are known to have resistance to diclofop-methyl, flucarbazone-sodium, halosulfuron-methyl, haloxyfop-methyl, and tepraloxydim and they may be cross-resistant to other herbicides in the Groups A/1, and B/2. Field, Greenhouse, and Laboratory trials comparing a known susceptible Hedgehog Dogtailgrass biotype with this Hedgehog Dogtailgrass biotype have been used to confirm resistance. For further information on the tests conducted please contact the local weed scientists that provided this information. There is no record of differences in fitness or competitiveness of these resistant biotypes when compared to that of normal susceptible biotypes. If you have any information pertaining to the fitness of multiple resistant Hedgehog Dogtailgrass from Chile please update the database. The Herbicide Resistance Action Committee, The Weed Science Society of America, and weed scientists in Chile have been instrumental in providing you this information. Particular thanks is given to Nelson Espinoza for providing detailed information. Espinoza, N. ; Díaz, J. ; Galdames, R. ; Rodríguez, C. ; Prado, R. de ; Ruiz, E.. 2009. Resistance map to herbicides in sourthern of Chile. : 477 - 480. In order to determine the magnitude of the herbicide resistance in southern Chile, seeds of Lolium multiflorum, L. rigidum, Avena fatua and Cynosurus echinatus were collected during the period 1998-2007, from wheat commercial field suspected be herbicide-resistant. In bioassays conducted on plants and using either the standard loglogistic regression or a dose of herbicide 50% upper than technical dose, the biotypes were characterized in terms of their response to ACCasa (diclofop, clodinafop, haloxyfop, clethodim tepraloxydim and pinoxaden), ALS (iodosulfuron, iodosulfuron+mesosulfuron and flucarbazone) and glyphosate herbicides. In A. fatua there was resistance only to ACCasa, while in C. echinatus and L. rigidum there was resistance to ACCasa and ALS. In L. multiflorum there was resistance to ACCasa, ALS and glyphosate, however only a small number of biotypes were resistant to the latter herbicide. Mainly, the resistant biotypes of L. multiflorum, A. fatua and C. echinatus, were collected in the Araucanía region, while biotypes of L. rigidum were from the Bío Bío region..
Espinoza N., N. ; Díaz S., J. ; Prado A., R. del. 2005. The history of herbicide-resistant weeds in Chile. : . 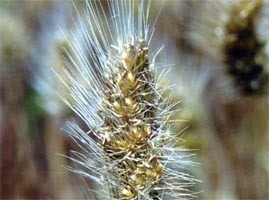 Eight biotypes of herbicide-resistant weeds have been described in Chile. All belong to grass weeds, specifically wild oat (Avena fatua), ryegrass (Lolium rigidum), Italian ryegrass (L. multiflorum) and crested dogtailgrass (Cynosurus echinatus), which are the most common in the main wheat, barley, oats, lupin and canola producing area (36°S to 39°S). The biotypes have shown resistance to ACCasa, ALS and EPSP inhibitors. Most biotypes have appeared in farm fields subjected to intensive land use, with annual crops, with a trend to wheat monoculture in some cases, and with intense use of no-till and herbicides with similar mode of action. Herbicides most frequently used have been glyphosate (EPSP), diclofop-methyl and clodinafop-propargyl (ACCasa). Cross-resistance to ACCasa was found in some biotypes of wild oat and ryegrass, with greater resistance to aryloxyphenoxypropionates than to cyclohexanediones. All ACCasaresistant biotypes were susceptible to iodosulfuron and flucarbazone Na (ALS). These two herbicides are recommended for wheat and began to be used just recently in the country. Two biotypes of Italian ryegrass were found resistant to glyphosate. One of these biotypes showed, in addition, resistance to ALS; that is to say, showed multiple resistance. Also the crested dogtailgrass biotype showed multiple resistance to ACCasa and ALS..